direction’s consulting and meeting facilities are situated in central Edinburgh. Our room is warm and welcoming with natural daylight. The room is available to hire on an hourly basis during the day, evenings and at weekends. We are easily accessible by bus, car, tram and train. We are located a short walk from Waverley train station, York Place tram stop and St Andrew Square bus station. There is free on street parking for up to 1 hour and a space to keep bicycles secure. 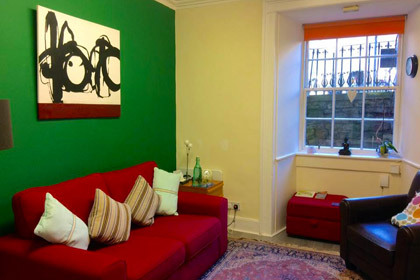 We carry out our own counselling and psychotherapy services here so we understand the necessity for a well maintained, welcoming and comfortable space for you and your clients. We offer our room to other practitioners to hire so that we can offset some of the running costs, enabling us to provide our counselling services to those who can less afford.